The 2019 International Education Expo Hall is more than 90% sold! Secure your spot today. Learn essential information about purchasing exhibit space at the NAFSA Annual Conference & Expo. Preview booth options, reserve a booth, submit payment, and learn important deadlines for exhibiting at NAFSA 2019 in Washington, D.C.
View the NAFSA 2019 Exhibiting and Sponsorship Prospectus to explore the Washington D.C. Convention Center floor plan as well as the many sponsorship opportunities to elevate your brand and reach across NAFSA's Annual Conference attendees. Preview booth options and select the prime booth location with the NAFSA 2019 Interactive Floor Plan. Available booths are shaded in grey. Black rectangles and squares indicate columns within the Expo Hall. Multi-booth configuration requests should be sent to exhibits@nafsa.org prior to booking a booth. All booth prices listed in United States Dollars (USD). Use NAFSA’s Exhibit Booth Price Calculator to receive an estimate for your booth purchase. Premium booths are marked with the letter “P” within the floor plan. Hanging signs require a minimum booth size of 20'x20' (400 sq ft.) and are an additional rental cost. Learn about the benefits of your booth purchase in the What's Included in My Booth Purchase resource. ** See the extended 2019 Sales Calendar for tiered Global Partner sales dates. *Payment due at signing with credit card payment. Payable within 30 days if paying by check or wire transfer. If paying by credit card, a 50% deposit is due at time of rental within the Booth Sales Portal. Payments by check or wire transfer must be submitted to NAFSA within 30 days of booking. Information on submitting payment can be found using the links below. Exhibitors may pay their full booth balance at anytime with a credit card online within the Booth Sales Portal. Questions About Your Booth Purchase? Cancellation of exhibit booth space must be in writing and postmarked by the cancellation deadline of March 8, 2019. Deposits are nonrefundable, regardless of the date of cancellation. Cancellations are subject to a liquidated damages payment of 75% of the total exhibit booth rental because of the difficulty of determining and proving NAFSA’s actual losses. There will be no refunds for cancellations received after 5:00 p.m. on March 8, 2019 (Eastern Daylight Time). No shows shall be treated as cancellations. Upon cancellation (including no shows), NAFSA has the right to resell the space and retain all revenue collected. Login to the Exhibitor Portal to complete your exhibitor tasks, review show information, and download exhibitor resources. 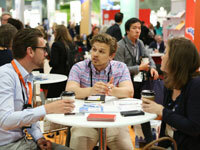 Note: Booth Contacts will need to be logged into their NAFSA Passport accounts to access the Exhibitor Portal. Visit the Show Logistics page for information about the convention center and additional exhibitor services.